BACKGROUND AND PURPOSE: Wernicke encephalopathy (WE) is a severe neurologic disorder resulting from dietary vitamin B1 deficiency. This study was undertaken to analyze and compare MR imaging findings and neurologic manifestations at clinical presentations of patients with WE with and without a history of alcohol abuse. MATERIALS AND METHODS: WE patients were identified using diagnostic neurologic data bases. Fifty-six patients (29 females, 27 males) diagnosed between 1999 and 2008 with WE who improved within 1 month from the onset of thiamine administration were included in the analysis. Patients’ records were reviewed for clinical manifestations and imaging studies’ findings. MR imaging was performed in the acute phase of the disease at a field strength of 1T (16 patients) and 1.5T (40 patients). All MR images were of acceptable to good quality and were retrospectively reviewed. We compared imaging findings and clinical presentation in the alcoholic (AL) group versus the non-alcoholic (NA) group using the 2-tailed Fisher exact test and the Phi coefficient as appropriate. RESULTS: Forty-three percent of the patients were in the AL group, whereas 57% were in the NA group. Eighty-nine percent showed changes in consciousness, 75% had ocular manifestations, and 54% had ataxia. On MR imaging, 80% of the patients had evidence of symmetric lesions in the medial thalami and in the periventricular region of the third ventricle; 59%, in the periaqueductal area; 45%, in the mamillary bodies; 36%, in the tectal plate; and 7%, in the periventricular gray matter located anteriorly to the fourth ventricle. Signal-intensity alterations in areas considered atypical for the disease were noted only in the NA group and always in association with the typical findings. Contrast enhancement of the thalamus and mamillary bodies was significantly associated with alcohol abuse. CONCLUSIONS: Contrast enhancement in the mamillary bodies and thalamus is a typical finding of the disease in AL patients. Atypical MR imaging findings characterize NA patients. The aim of this study was to analyze a larger population of patients from multiple centers to establish whether the results of our previous study could be replicated. A specific aim was to compare the clinical and neuroradiologic data of AL and NA patients, because our previous report had shown some differences between the findings of AL and NA patients.3 For instance, contrast enhancement of the mamillary bodies had been shown to correlate positively with alcohol abuse, whereas atypical MR imaging findings had been found more frequently in NA patients.3 These data suggest that in AL and NA patients with WE, partially different metabolic pathways may be involved, leading to different MR imaging lesions. This study included patients already reported in a previous retrospective study followed up with time and new patients recruited from additional hospital centers.3 Similar to our previous study, it has been designed to compare neuroimaging findings and clinical features of AL and NA patients with WE at presentation. A multicenter study group retrospectively reviewed MR imaging findings and clinical records of 56 patients (29 females, 27 males) diagnosed between 1999 and 2008 with WE. The age range was 6–88 years (mean age, 50.3 ± 17 years). Patients were identified by searching neurologic and neuroradiologic diagnostic data bases. Patients’ records were reviewed for clinical history, symptoms at presentation, imaging techniques, and findings. Inclusion criteria consisted of a clinical diagnosis of WE and improvement at clinical presentation within 1 month from the onset of thiamine administration. MR imaging examinations were performed during the acute phase of the disease at field strengths of 1T (16 patients) and 1.5T (40 patients). Eleven of 56 (20%) MR imaging examinations showed movement artifacts; nevertheless, the scans were included in the study because they were considered to have acceptable diagnostic quality. Imaging sequences of the brain included long-TR, short-TE spin-echo sequences, and contrast-enhanced short-TR images in multiple planes. We compared imaging findings and clinical presentation in the AL group versus the NA group by using the 2-tailed Fisher exact test. When the test showed a significant association, we calculated the Phi coefficient to determine the strength of the relationship (statistical application package: Statistical Package for the Social Sciences, Version 15; SPSS, Chicago, Ill). Twenty-four (43%) patients affected by WE had a history of chronic alcohol abuse. Thirty-two (57%) patients affected by WE did not. In the NA group, the most frequent cause of thiamine deficiency was malabsorption secondary to a neoplasm of the gastrointestinal tract (14/32 patients, 44%). Among these patients, 4 underwent surgery for gastric cancer. Eleven (34%) patients had hyperemesis (4 with hyperemesis gravidarum, 6 with hyperemesis due to chemotherapy, and 1 with hyperemesis due to a gastrointestinal tract neoplasm). Seven (22%) of 32 patients had severe malnutrition caused by prolonged voluntary starvation (5 patients), anorexia nervosa (1 patient), and socioeconomic poverty (1 pediatric patient). The most frequent neurologic findings were changes in consciousness in 50/56 patients (89%, 20 AL versus 30 NA). These changes showed a wide spectrum of presentations ranging from mild disorientation to coma. Forty-four patients (79%, 22 AL and 22 NA) showed ocular dysfunction. Thirty patients (54%, 17 AL and 13 NA) showed ataxia. With regard to changes in consciousness, no significant difference was found comparing the AL with the NA group. Ocular dysfunction was significantly more frequent in the AL group (P = .039, Phi = 0.276). Ataxia was significantly more frequent in the AL group (P = .025, Phi = 0.300). Only 24/56 patients (43%, 13 AL and 11 NA) presented with the classic triad of the disease. All 56 patients underwent MR imaging. 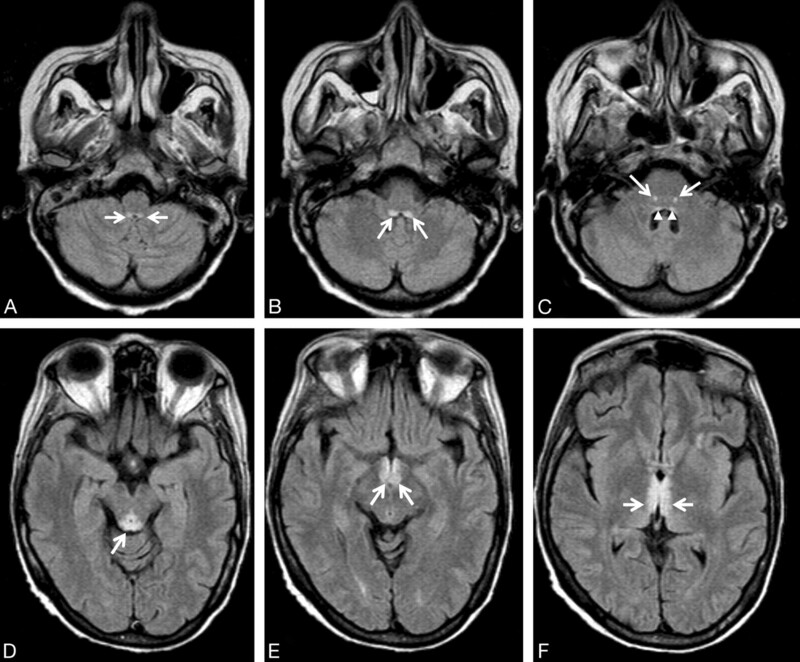 The findings were symmetric hyperintensity on T2-weighted and fluid-attenuated inversion recovery (FLAIR) images; symmetric hypointensity or no abnormalities on T1-weighted images; and symmetric areas of contrast enhancement after gadolinium injection in the thalamus, periventricular region of the third ventricle, mamillary bodies, periaqueductal area, tectal region, periventricular gray matter of the fourth ventricle (typical findings) and in the CNN, cerebellum, and supratentorial brain cortex (atypical findings). Forty-five (80%) patients showed symmetric lesions of the medial thalami and of the periventricular region of the third ventricle (15 AL and 30 NA). Thirty-three (59%) patients showed alterations of the periaqueductal area (11 AL and 22 NA). Twenty-five (45%) patients showed alterations of the mamillary bodies (8 AL and 17 NA). Twenty (36%) patients showed alterations of the tectal plate (3 AL and 17 NA). Ten (18%) NA patients showed symmetric lesions of the CNN (VI, VII, VIII, XII) (Fig 1). 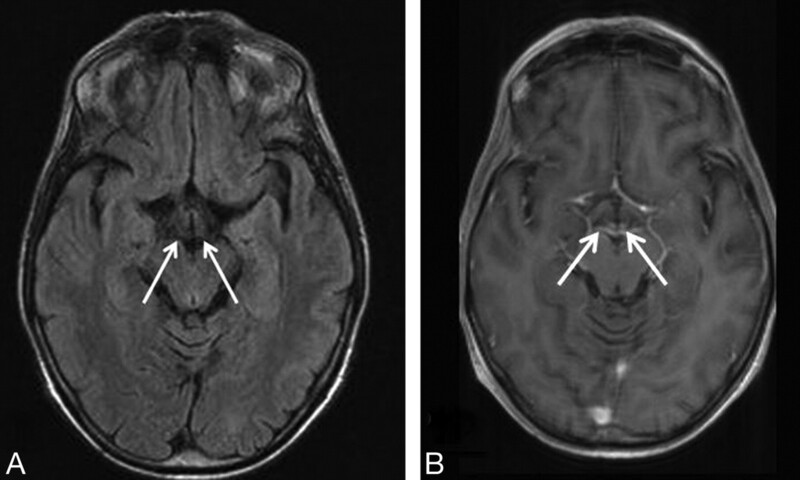 A 54-year-old woman with leukemia, changes in consciousness, and ataxia. FLAIR axial images (11,000/140/2 [TR/TE/NEX]). A, The prepositus hypoglossal nuclei show symmetric high-signal-intensity alterations (arrows). B, The medial vestibular nuclei show symmetric hyperintense lesions (arrows). C, Symmetric high-signal-intensity alterations in the facial nuclei (arrows) are detected. Subtle signal-intensity alterations in the abducens nuclei are seen (arrowheads). D, The tectum of the midbrain and the periaqueductal gray matter shows signal-intensity alterations (arrow). E, The mamillary bodies (arrows) show signal-intensity alterations. F, Note signal-intensity alterations (arrows) of the medial thalami and periventricular region of the third ventricle. Four (7%) patients showed signal-intensity alterations in the periventricular gray matter located anterior to the fourth ventricle (1 AL and 3 NA). Three (5%) NA patients showed symmetric alterations of the cerebellum. Two (4%) NA patients showed signal-intensity alterations in the vermis. One (1.8%) NA patient showed bilateral signal-intensity alterations in the dentate nuclei. One (1.8%) NA patient showed bilateral signal-intensity alterations of the pre- and postcentral cortex (Fig 2). Regarding the presence of signal-intensity alterations on unenhanced sequences involving anatomic regions considered typical and atypical for the disease, statistically significant positive associations were found between NA and signal-intensity alterations seen on long-TR spin-echo sequences at the level of thalami (P = .004, Phi = 0.389), tectal plate (P = .002, Phi = 0.420), and CNN (P = .003, Phi = 0.404), respectively. A 54-year-old woman with a history of food refusal had changes in consciousness. FLAIR coronal images (11,000/140/2 [TR/TE/NEX]). A, Signal-intensity alterations with different intensity patterns are seen in the thalami (arrows). Diffuse signal-intensity alterations of the frontal cortex (arrowheads) are present. B, Note signal-intensity alterations in the mamillary bodies (arrows), periventricular region of the third ventricle (empty arrows), and brain cortex (arrowheads). Contrast medium was administered in 41/56 (73%) patients (18 AL and 23 NA). Among these patients, 26/41 (63%, 17 AL and 9 NA) showed contrast enhancement. The anatomic structures that most frequently enhanced were the mamillary bodies (16 patients), followed by the tectal plate (8 patients), thalamus (8 patients), periaqueductal area (7 patients), and CNN (1 patient). Three AL patients showed contrast enhancement in the mamillary bodies as the only sign of the disease. Eight AL patients and 1 NA patient showed contrast enhancement but no signal intensity alterations on long-TR spin-echo sequences (P = .002, Phi = 0.481) (Fig 3). There was a significant positive association between AL and contrast enhancement in the mamillary bodies (P = .001, Phi = 0.501). A 47-year-old woman with a history of alcohol abuse presented with ataxia, changes in consciousness, and ocular abnormalities. A, FLAIR axial image (9000/114/1 [TR/TE/NEX]). No signal-intensity alteration are seen at the mamillary body level (arrows). B, T1-weighted axial image (551/14/2 [TR/TE/NEX]). Contrast enhancement is seen in the mamillary bodies (arrows). A statistically significant positive association (P = .006, Phi = 0.433) between contrast enhancement in the thalami and AL was also found. A history of hyperemesis and chemotherapy showed a statistically significant positive association with CNN involvement (P = .006, Phi = 0.498; and P = .008, Phi = 0.474, respectively). No patient showed hydrocephalus. Data on histories, clinical manifestations, imaging techniques, and findings in both groups are summarized in On-line Tables 1 and 2. Table 1 shows the topographic distribution of lesions in both groups. Table 2 shows the neurologic symptoms typical for the disease in both groups. In our case series, enhancement (suggestive of damage) at the level of the blood-brain barrier was observed in the AL and NA groups. However, a statistically significant positive correlation was shown only between contrast enhancement in the mamillary bodies and thalami on the one hand and alcohol abuse on the other, supporting the hypothesis that alcohol may contribute to increased blood-brain barrier permeability.30 The correlation between alcohol abuse and damage to the blood-brain barrier is not supported by the results of the retrospective study by Fei et al,11 who concluded that “typical symmetric damage of the mammillary bodies and brain paraventricular regions may permit a specific diagnosis of nonalcoholic WE.” However, the study of Fei et al included only 3 patients who underwent contrast-enhanced MR imaging, and no formal comparison was made between AL and NA patients. In contrast, both this and our previous3 studies have shown that mamillary bodies and thalami are more frequently affected in AL patients; this finding suggests that these regions may be particularly susceptible to the toxic effects of alcohol. Among the neurologic manifestations at presentation, ataxia was positively associated with AL despite the lack of overt cerebellar lesions, whereas infratentorial signal-intensity alterations were only seen in NA patients. Cerebellar alterations were reversible and always associated with the other typical but also atypical findings, in agreement with previous reports.3,5–7,9 We, thus, speculate that in our AL patients, subtle damage to the cerebellum induced by chronic alcohol consumption may have pre-existed.30 Pathologic studies have demonstrated a higher prevalence of cerebellum involvement compared with that observed on imaging studies. More specifically, it has been reported that the cerebellum is involved in more than half of patients with WE.31 There are a few published cases on selective CNN involvement, which have described abducens, facial, vestibular, and hypoglossal nerve nuclei signal-intensity alterations only on long-TR images.3,5,6 These changes have invariably been found in NA patients and in association with the other typical alterations of the disease. So far, the question of whether CNN involvement represents a distinctive pattern of involvement in NA patients has remained unanswered. The results of our study lend support to the hypothesis that CNN involvement is a typical finding of NA patients, by showing a statistically significant association. The differential diagnosis of symmetric signal-intensity alterations of the dentate nuclei, vestibular, abducens, red nuclei, and splenium includes metronidazole-induced encephalopathy (MIE).32 NA patients with WE may show virtually the same MR imaging features typical of MIE, in addition to those typical of the disease.6,8,16 Therefore, the differential diagnosis may be difficult in malnourished patients treated with metronidazole. None of our NA patients showing alterations in the cerebellum, vermis, and dentate nuclei and CNN involvement had a history of metronidazole treatment, with only the exception of patient 1 (On-line Table 2). This finding raises the question of whether WE and MIE share similar metabolic pathways. Does Chronic Alcohol Abuse Increase Blood-Brain Barrier Permeability? In our patient population, we found a total of 8 patients (7 AL and 1 NA) showing contrast enhancement in areas typical of WE in the absence of alterations on long-TR sequences. 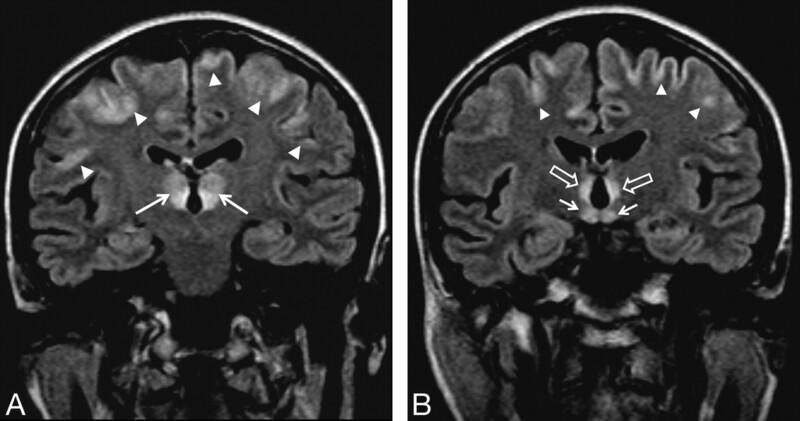 This pattern has also been described in a pediatric patient, who showed signal-intensity alterations of the medial thalami and periaqueductal gray matter,33 and it may be due to the well-known “fogging effect”34 or to the increased detection of small lesions with contrast-enhanced T1-weighted images compared with T2-weighted ones.35 Weidauer et al36 described the aforesaid effect in 5 of their 7 MR imaging–positive patients with WE; among those showing positive contrast enhancement without alterations on long-TR images, the mamillary bodies were the most frequently affected structures (4 of 5 patients). Thus, it may also be speculated that this phenomenon, which has been frequently found at the level of the mamillary bodies, may be due, to some extent, to a partial volume effect related to the small size of the structures involved, such as the mamillary bodies. These findings support the hypothesis that alcohol may damage the blood-brain barrier. They also suggest that contrast-enhanced MR imaging should be performed when no signs of WE are seen on unenhanced MR images. The main limitation of our study is its retrospective design, because data have been collected from multiple centers during a 9-year period. In particular, the absence of predefined criteria for diagnosis may have introduced a selection bias. More specifically, some patients with WE may not have been identified due to missed clinical diagnoses, particularly if they had atypical clinical manifestations and no history of alcohol intake. Therefore, these 2 categories of patients may be under-represented. However, despite this limitation, we have still collected a large enough number of NA patients to allow meaningful comparison with AL patients. An additional bias is that MR images have been obtained from units with different field strengths and different diagnostic performances. The results of our study confirm the usefulness of MR imaging in the early diagnosis of acute WE. Furthermore, we have been able to demonstrate that AL patients with WE appear to differ from NA patients in terms of MR imaging findings. Alcohol abuse may alter the blood-brain barrier, even in absence of long-TR signal-intensity alterations, as revealed by symmetric contrast enhancement in areas typically involved by WE. More specifically, we have observed more frequent contrast enhancement in the mamillary bodies and thalami in AL compared with NA patients, suggesting that these areas may be particularly susceptible to the toxic effects of alcohol. In contrast, we have demonstrated that MR imaging findings usually considered atypical for WE, seem, in fact, to be characteristic of NA patients. The reason why atypical lesions are seen only in NA patients is unclear, but we speculate that alcohol may have a protective effect on the brain areas that show atypical lesions in WE. On the other hand, atypical WE brain lesions resemble those of MIE, a finding that may suggest that WE and MIE share common metabolic pathways. In conclusion, our study provides evidence that MR imaging is useful in diagnosing early WE. MR imaging has a valuable diagnostic role, particularly in those patients with no history of alcohol abuse or presenting with atypical clinical manifestations, in whom the clinical diagnosis is more easily missed. In addition, MR imaging can help to distinguish AL from NA patients with WE. We thank Drs Jaume Capellades, Jessica Mandrioli, Teresa Cabada Giadás, Luana Regnicolo, Renzo Manara, Luca Santelli, Bruno Tumiati, and Walter Bottari for their participation in the Wernicke Encephalopathy Working Group. Paper previously presented in part at: Annual Meeting of the American Society of Neuroradiology, May 31–June 6, 2008; New Orleans, La. Indicates article with on-line tables. Accepted after revision July 15, 2008.